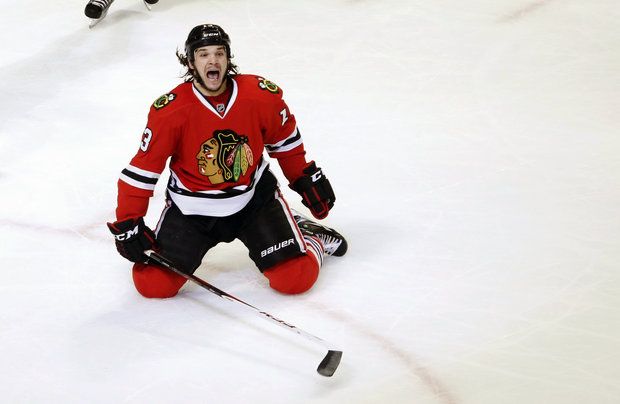 The Blackhawks had another hero, Danny Carcillo scored the game winner Wednesday. The story and the excitement keep building for the Blackhawks. Halfway through the NHL season, they have yet to register a loss in regulation (21-0-3). Tonight they hope to continue this unbelievable ride with a rematch with the Avalanche in Colorado. A few injuries are a concern, specifically Patrick Sharp. But this team has had different players step in and step up. Last game Danny Carcillo scored the game winner in the final seconds. After the win, coach Joel Quenneville refereed to Carcillo by his nickname, “Car-bomb”. That may offend some, but it was funny just to hear that nickname used by a coach. As the Hawks keep winning, the Derrick Rose drama for the Bulls is going on and on. It almost feels like the movie Groundhog Day. Twenty one games left on the NBA schedule, still no decision in sight. Now there is daily reporting when he sits with the team on the bench and when he doesn’t. It is just becoming too monotonous for everyone. Tonight the Bulls host Utah and then spend the next week on the road. Two kicks for one young lady, ten steps back for women in pro-sports? Much has been made about the failed kicks by Lauren Silberman, at the NFL regional combine event in Florham Park, N.J. The former soccer player made two very poor attempts in kicking try-outs that resulted in a flurry of responses. There are indications that Silberman was hurt. She should have postponed the workout or not done it at all. The other major factor: she has never played collegiate football. That could be more of the problem about her failed attempt at the NFL regional combine. One thing that you learn physically in the sports world -- man or woman -- is know your limitations. Silberman should have learned a valuable lesson. If you are injured, not prepared or do not have the aptitude to do it (particularly when it is impactful) rethink your situation. Speaking of impacts, there is no doubt that Northwestern Women’s Lacrosse coach Kelly Amonte-Hiller continues to be a force in her sport. On Wednesday, she registered career win 200 when the Wildcats won their home opener beating Boston College 17-10. Tomorrow 4-1 Northwestern will play at John Hopkins on the east coast. Did you realize that the Big Ten women’s basketball tournament is in the Northwest suburbs at the Sears Centre Arena? Most people haven’t a clue about that event. The arena has had a tough time trying to stay afloat and the businesses in Hoffman Estates are hoping this tournament will be a boost. It is a real bargain with the tickets going for $15 a session. Next weekend when the men play at the United Center, you will see a lot more attention for that event (and pay much more). Dennis Rodman being part of the theatre of the absurd is always a natural in the sports world. It is ridiculous and dangerous when the former Bulls player steps into the international political world. The eccentric and controversial former NBA player went to North Korea to be entertained and seen with the country&apos;s leader Kim Jong-Un, it made headlines. You would think it was a sketch from Saturday Night Live. A sketch would be funny, the real scenario was not and makes you wonder: what was Rodman thinking? Having been around Rodman while he played for the Bulls, he doesn&apos;t think, nor does he care about most things. Dennis just does what he wants to do and if he gets paid, so much the better. Maybe Rodman thought it was all fun and games like a reality show. But when he visits a country that has declared the U.S. as its sworn enemy, it begs the question: Does he have any common sense at all? Apparently not. Bears cutting ties with defensive back DJ Moore made a lot of reporters unhappy. He was one of the few players on that team that didn’t filter his thoughts about anything and anyone (including Jay Cutler). His playing time diminished after he made the negative comments about the Bears QB. Coincidence? The baseball season begins three weeks from Monday. I miss Ozzie Guillen! This will be the first time in years he will not be in a dug-out. Some how, some way he will be heard. Yesterday the White Sox extended the contract of left hand pitcher Chris Sale 5 years to the tune of $32.5 million. There are two two option years on the back end that can net him millions more. And the Cubs are selling single game tickets today. Nice to think about baseball, when you have mounds of snow all around. Season begins April 1st - no fooling.